Bearing the name of the world’s leading packaging machinery manufacturers, EndFlex, WeighPack Systems, SleekWrapper, and CombiScale, it goes without saying that Paxiom has become the talk of the industry when it comes to cup filling machine solutions. Among the several technologies that we offer, one of which is the conveying solutions. To be specific, we have our conveyors, bag collating and container filling systems. For our container filling machines that are also engineered to automatically fill cups we offer three. Apart from cups, our container indexing conveyors are also popular for automatically indexing and filling other rigid containers such as bottles, jars, cans, and clamshells. This stainless steel filling cup filling machine is great for filling cups and containers with products likes cherry tomatoes, fish flakes, mushroom trays, chicken strips, chocolates, nuts, snacks, as well as pharmaceuticals. Constructed with a complete stainless steel frame, our box indexing conveyor can automatically index and fill corrugated boxes, trays, cups, and rigid containers. It is equipped with triple pan configuration for increase accuracy, a pneumatic side shaker for product settling, two load cells per bucket for optimum weight registration, and PC controls with Windows operating system. 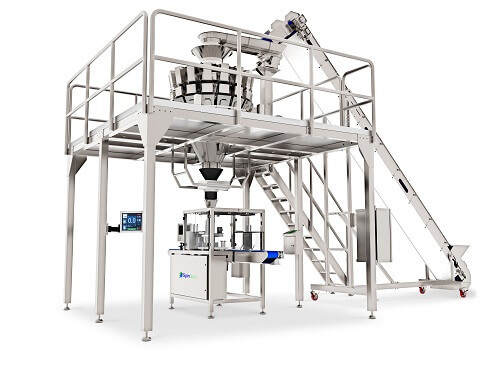 With this filling machine, you can easily operate scale and conveyor from one central touchscreen. Available in single and twin lane configurations, our box indexing conveyors are perfect for filling wrapped candy, beer hops, bulk pecans and more. Available in three models, the SpinDexer is designed to increase productivity when filling challenging products—light, irregular, or tight-fitting items—into rigid containers. With a maximum mechanical rating of up to 100 cycles per minute, the SpinDexer is perfect for filling products like vitamin gummies, cheese balls, pretzels and narrow nut into containers at high speeds. It includes tool-less removable funneling and star wheel for faster access and easy sanitation. Moreover, it has a compact design and is easy to use. The SpinDexer includes sensing devices to help increase throughput as a result of higher efficiency. Equipped with a stainless steel frame and servo drive, this filling machine is without a doubt engineered with serviceability and reliability in mind.